Facebook is used by just about everyone on the Internet to share pictures and stay connected with friends and family. Even though we are so reliant on Facebook there are still many features that Facebook has implemented that annoy users. If you are one of the the Facebook users that find many things annoying on Facebook there is a way to tweak settings to fix those annoying issues. Facebook is always tweaking their layout to try and improve things but this can end up frustrating users instead of making users happy. If there are parts of the Facebook layout that you don’t like or if you want to try and tweak settings on Facebook then there is a browser extension that can help you fix your Facebook. 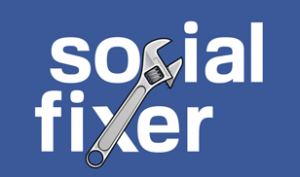 Social Fixer is a browser extension that you can download that will give you tons of different tweaks to make Facebook look they way you want. Social Fixer is a free browser extension for every browser but Internet Explorer, but you shouldn’t be using IE because there are so many better browsers. 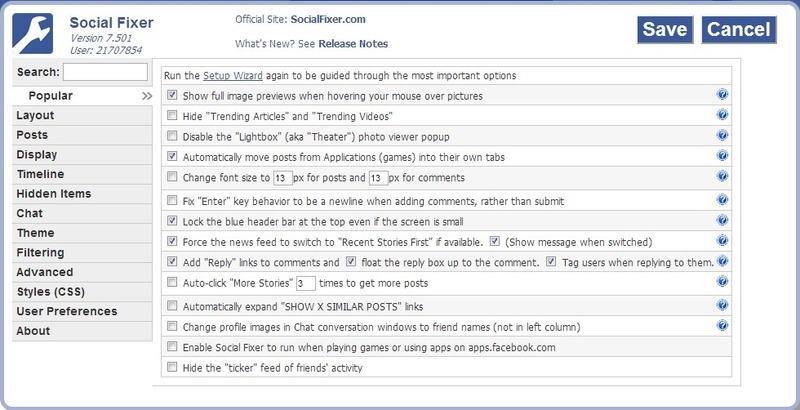 With Social Fixer, you can adjust so many different features and layout settings in Facebook. Social Fixer is a script that runs on your computer so it can only change certain parts of Facebook, but it allows you to customize the page in many different ways. Social Fixer runs when you first load Facebook so it will not slow down you browsing by running all the time. 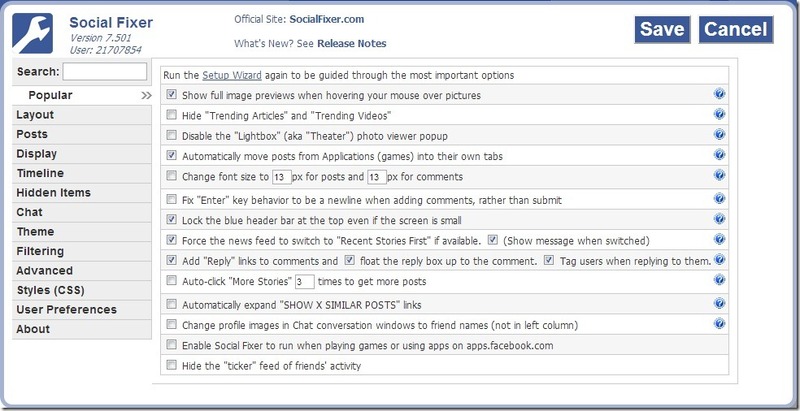 When you first start using Social Fixer you will go through a wizard which will setup some of the basic feature tweaks that you can use with social fixer. Even though Social Fixer has many different tweaks available there are a couple that I really like. The first is something that I always use because the people on my Facebook are always uploading and sharing photos and I get tired of having to click on each image. With Enlarge on hover Social Fixer tweak when you hover the mouse over any picture on Facebook you will see an image preview in the top right hand corner of the browser. This is really neat feature that allows you to quickly scan through images on your Facebook timeline and if you want to look at the images further you can still click on them to bring up the standard image gallery. Also if you don’t like the way Facebook shows pictures you can disable it with a different Social Fixer setting. There are many more settings you can tweak with Social Fixer some of the other tweaks that I use is change the Facebook news feed from showing top stories which are stories that Facebook thinks are important to you and instead of showing the Most recent posts.I believe that showing the most recent is better than just showing top stories because I can always scroll down to view older posts, but I feel like I miss posts when viewing the news feed by top stories.Social Fixer will also clean up the left column navigation and put all the pages you follow in one section that you can minimize to save space in the column. Social Fixer has so many different settings that you can use to tweak the look and feel of Facebook. 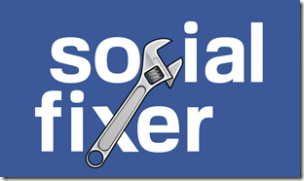 It is very easy to get Social Fixer running on your web browser and once you have it installed you can tweak as little or as much of Facebook as you want. If you have more that one computer or use different browser then you will need to install Social Fixer on each browser you use and then set it up. I recommend giving Social Fixer a try if you are annoyed by Facebook it may just fix your annoyances and make using Facebook much more enjoyable. To find out more about Social Fixer and everything it can do you can check the links below to get more info.